Mark Strong Sr., defendant in the first of two major trials in the high-profile Kennebunk Zumba prostitution case, stops to field a few brief questions from reporters before getting into his vehicle to leave the York Count courthouse in early March. 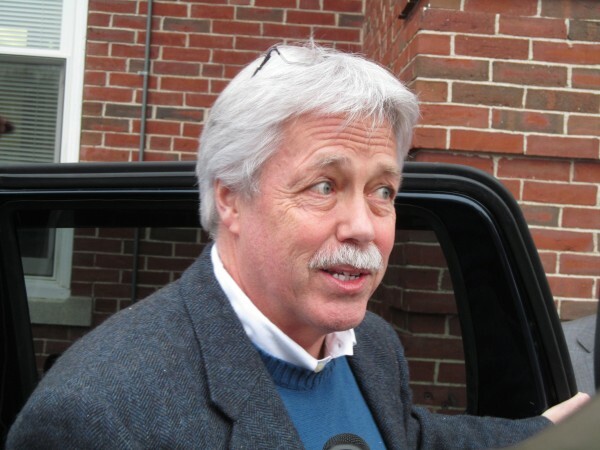 ALFRED, Maine — The Thomaston businessman accused of being the business partner of a Kennebunk Zumba instructor who has admitted to engaging in prostitution was released early from York County Jail. A jail official confirmed that Mark Strong Sr. was released from jail on Friday, five days before the end of his 20-day sentence for conspiracy and promotion of prostitution. Strong’s 20-day sentence reportedly was reduced for good behavior. Neither Strong nor his defense team, Portland attorneys Daniel Lilley and Tina Nadeau, could be reached for comment Friday evening. Zumba instructor Alexis Wright pleaded guilty last month to 20 counts of prostitution. In a plea agreement, prosecutors are recommending that Wright serve 10 months in jail. Wright also pleaded guilty to tax evasion and theft charges, however, felony charges have been reduced to Class E misdemeanor crimes as part of the deal. In addition to his jail sentence, 57-year-old Strong was ordered to pay $3,000 in fines as well as $80 per day of incarceration. He was convicted on 13 counts — 12 counts of promotion of prostitution and one count of conspiracy to commit the crime of promotion of prostitution. Wright had been indicted on 106 charges ranging from prostitution to invasion of privacy to welfare fraud. The invasion of privacy charges were dropped as part of the plea agreement after the dismissal of those same charges against Strong in February.